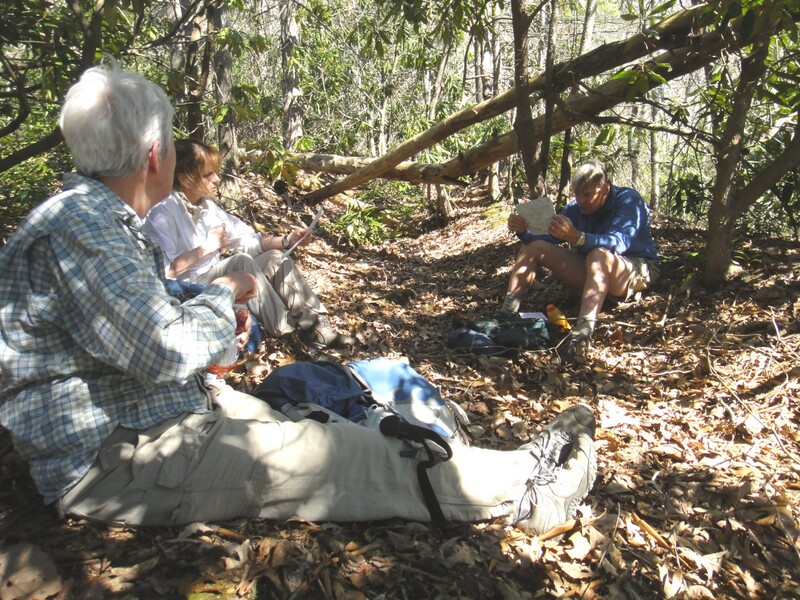 This outing was organized by Mike Knies as part of his ambitious, far-reaching program for hiking with friends this spring. Do I really mean both ambitious and far-reaching? Isn’t that redundant—in fact, isn’t that an example of just plain lazy writing? But I guess I do mean both of them. 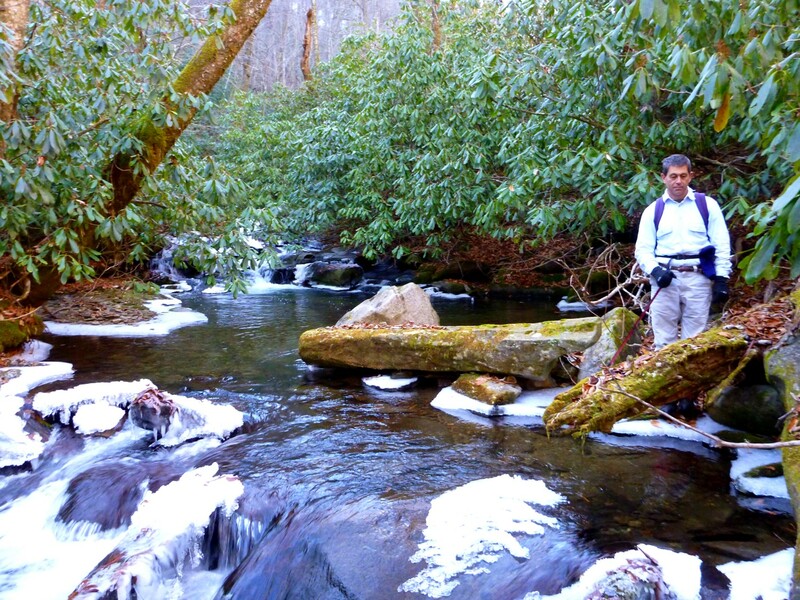 Mike’s program is ambitious in the sense that it includes a lot of unmaintained trails and it is far-reaching in the sense that its geographic scope goes from Elkmont to Greenbrier to Cataloochee to the Hyatt Ridge area. Just to put the icing on the cake, he then does a writeup on each hike that nearly always includes a witty title, and more often than not, he throws in some sort of obscure literary parody as a bonus. In the face of this overwhelming mastery of planning, hiking, and literary sport, I think I am going to avoid reinventing the wheel on this one and refer you to his writeup on the GoSmokies forum. 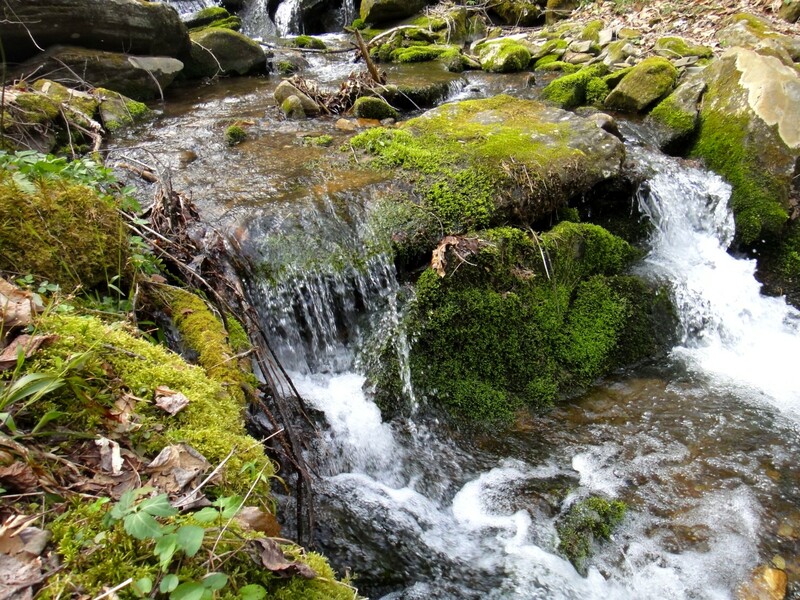 You will find a detailed account of the outing and an excellent map. What I offer here is mainly photos. 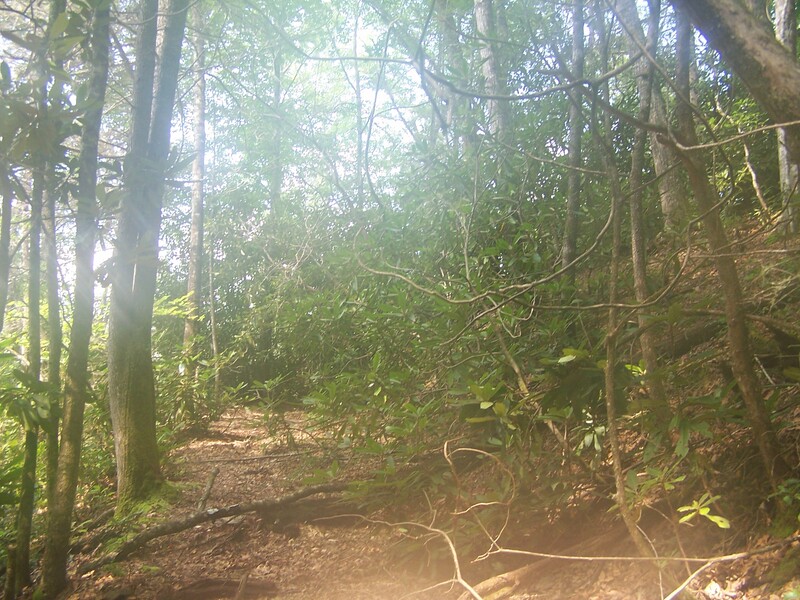 The old dug road connects Big Cataloochee with Little Cataloochee by way of Bald Gap (between Bald Top and Noland Mountain). 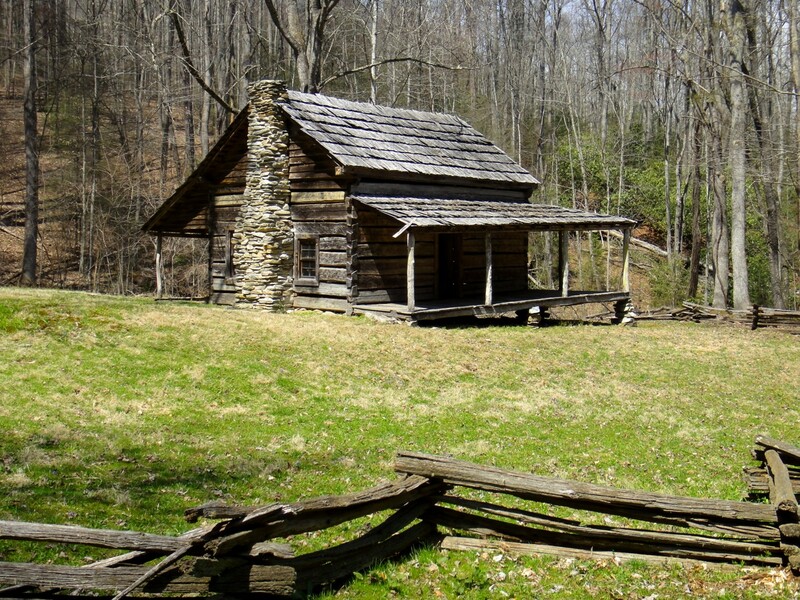 You find its start at a turnoff next to Palmer Cemetery and its end at the apple house across from the Cook Cabin on what is now the Little Cataloochee trail. It was dug out below the grade so that a draft animal could pull goods on a sled along it. Hattie Caldwell Davis, in her book Reflections on Cataloochee Valley, has a nice photo of a horse pulling a sled (see p. 48). She wrote, “Wagons were common, but sleds were more common. They were easy to build with two bent sourwood runners. There seemed to be one for every purpose: tobacco, hay, logging, and general hauling. 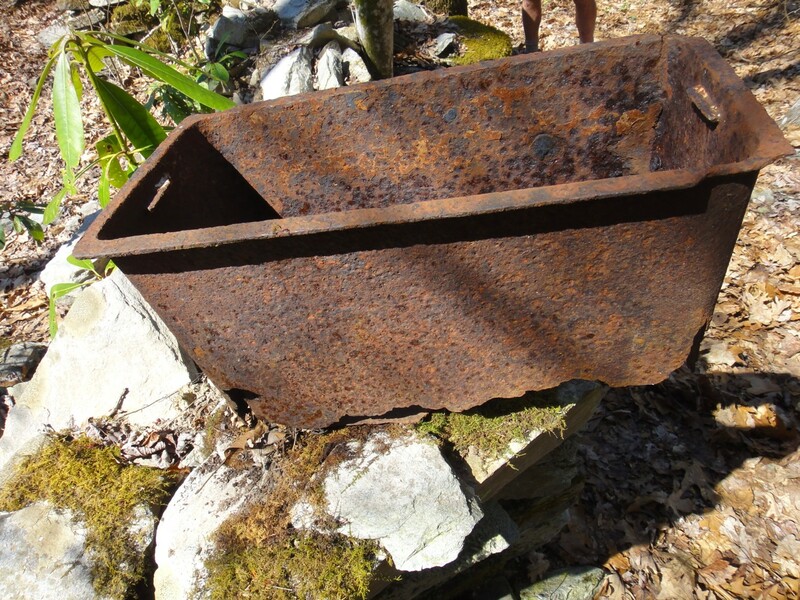 Sleds were cheap and went where wagons couldn’t go.”* The road was dug 48” wide in 1854 by the first two couples to live on the “back side” of Noland Mountain, doing the hard work with mattocks, pick, and shovel. Our group consisted of Mike, myself, Barbara Morgan, and Cindy McJunkin. Mike and Barbara had followed the dug road before, but it had been a long time, and it turned out we made a mistake at the very beginning and found ourselves on the west side of Jesse Ridge instead of the east. Around the time we realized we were on the wrong track, we spotted some elk in the woods. 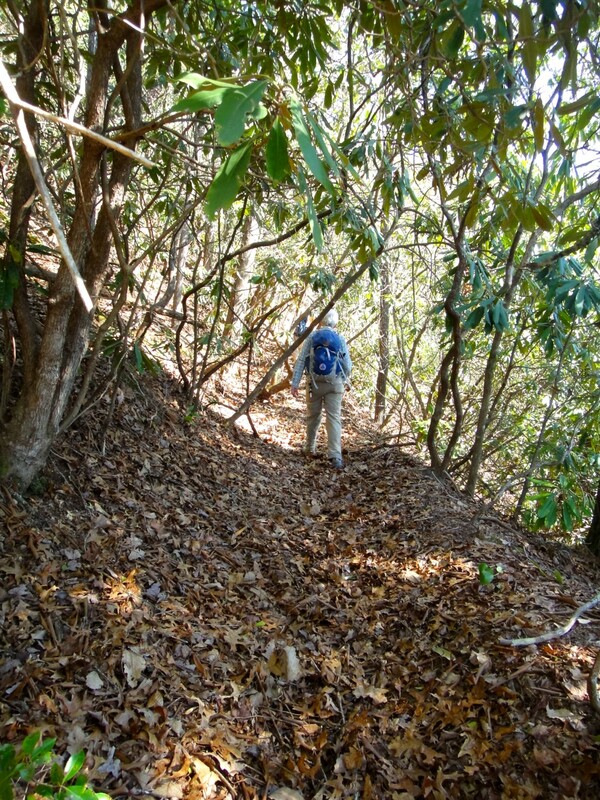 We bushwhacked east over the top of the ridge and eventually reached the dug road. It was easy and pleasant to follow. 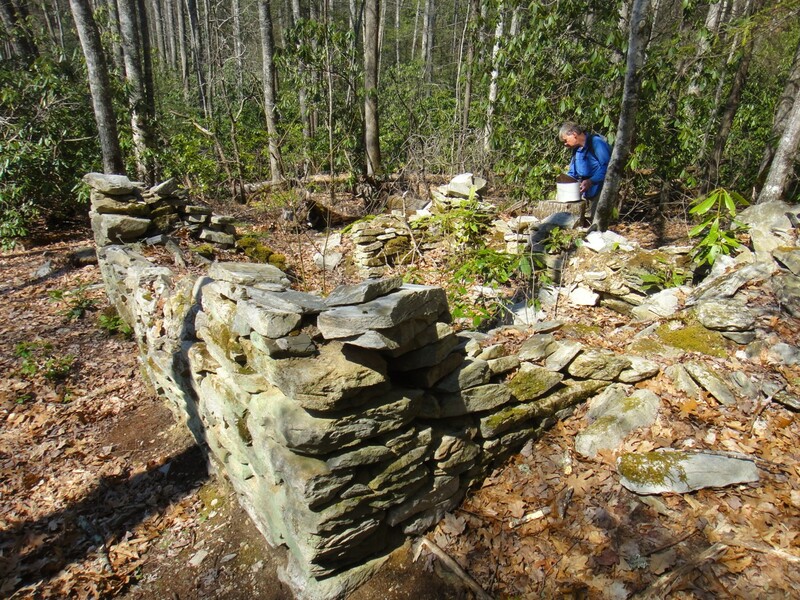 At 3500′ we started running into remains of old homesites and continued to find old walls, foundations, and various relics nearly up to the gap. 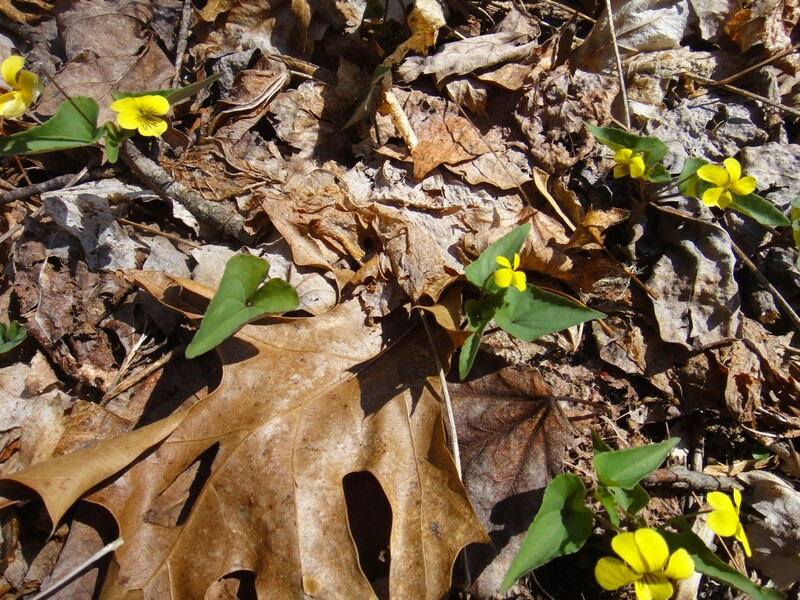 Yellow violets spangled the ground. We rambled upward to a very nice foundation. 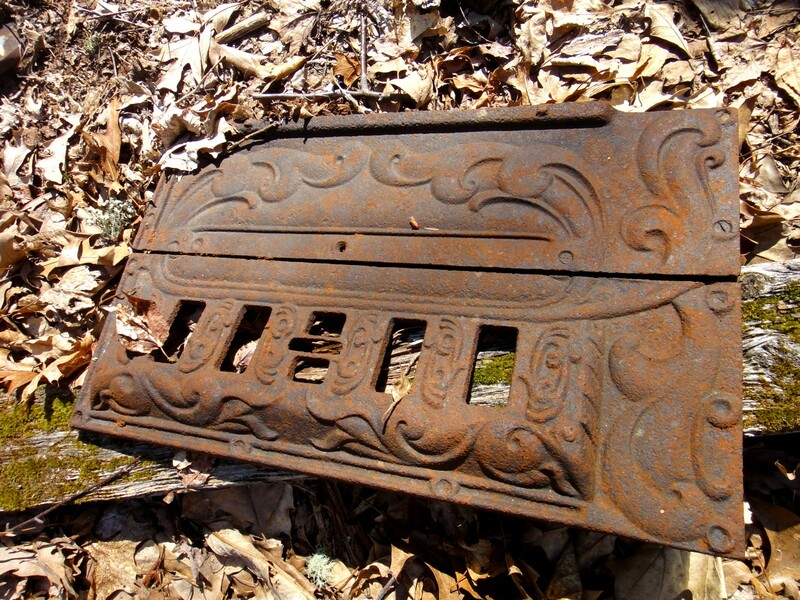 We found an old metal container. I don't know what this would have been used for. Tell me if you know. And a large ceramic jug. There was a lovely chimney in good condition. 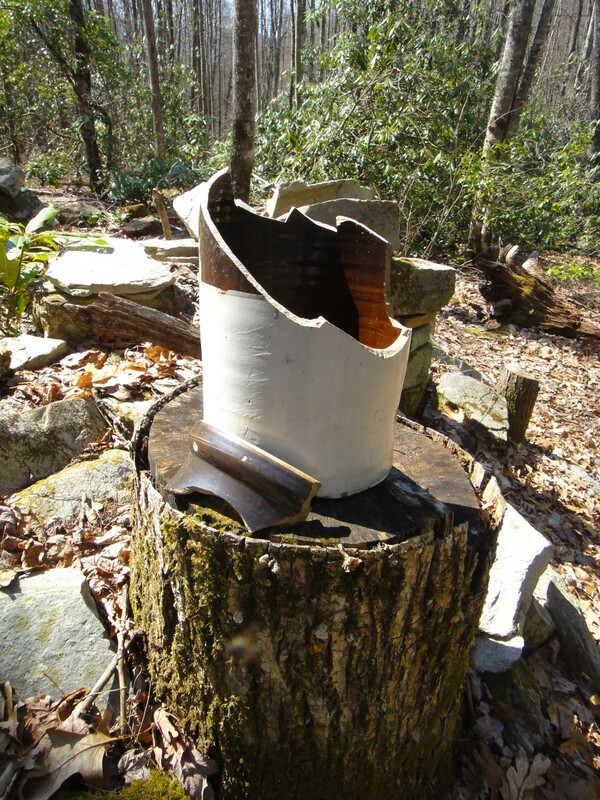 And part of a stove. 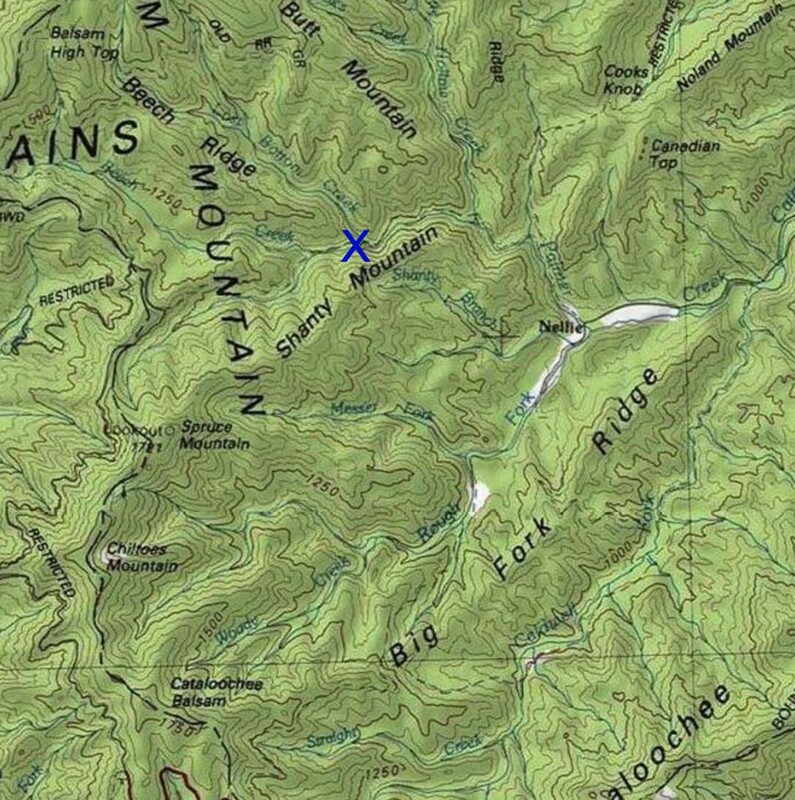 From the gap, the plan was to bushwhack over to hit a contour northwest of Noland Gap, intersecting the road further along instead of following it down immediately from the gap. The reason was that Barbara had tried unsuccessfully twice before to stay on the road and we felt we’d have a better chance of hitting it closer to its end. We did some steep sidehilling and arrived near Noland Gap. I would have just bushwhacked down to the Little C trail, but Mike hunted around and found the road. We came out right opposite the Cook cabin and sat on the porch for lunch. 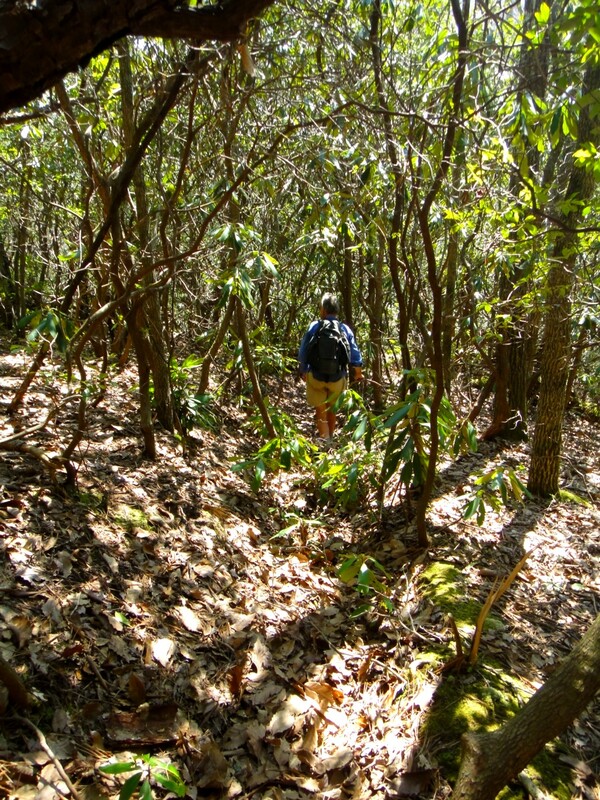 On the return, it was not hard to follow the road past where we’d hit it, up over Noland Gap, and down the other side. 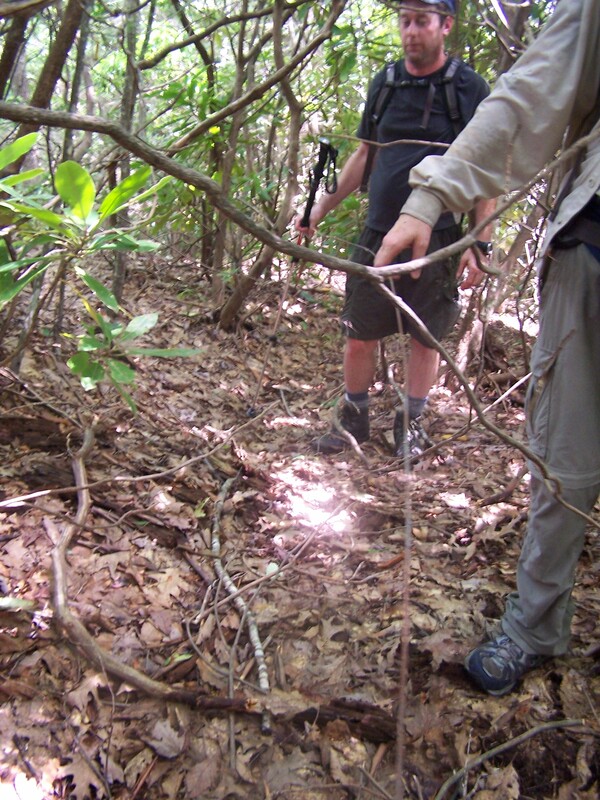 Our goal was to use the old path along the branch east of the gap and eventually arrive at the Cataloochee group camp, where we had a shuttled car waiting. We did come to a “Zone of Uncertainty” where the path runs very close to Hall Branch (formerly Nelson Branch). But eventually, by continuing downward and aiming toward flat areas likely to have old pathways, we picked up the track again. 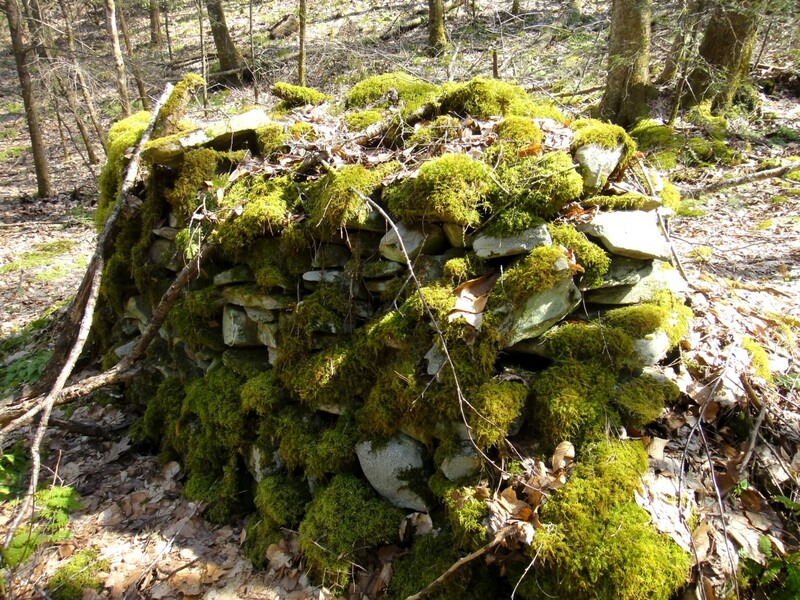 We found more homesites at around 3000′, with lots of old walls and piles of stones. We stopped for a rest break at a pretty place on the stream, not quite realizing yet that we were actually only five minutes away from our destination. 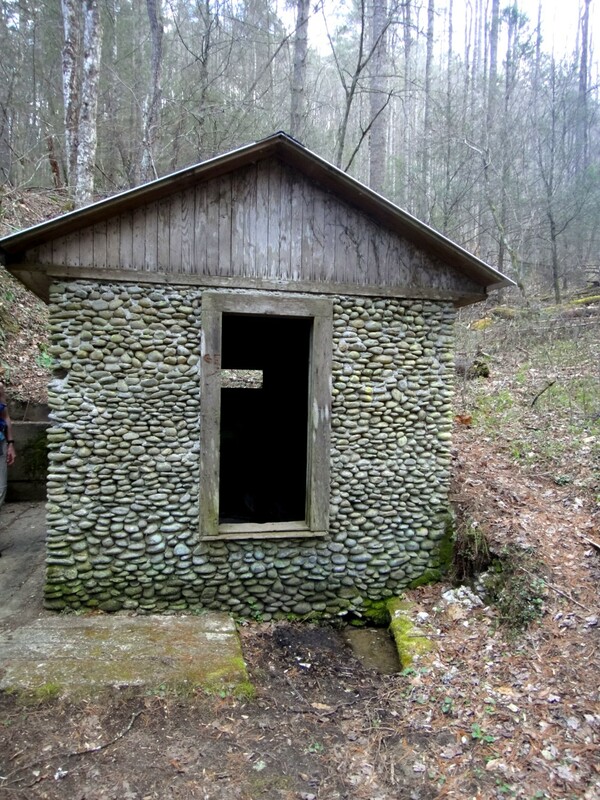 Just above the campground, we passed a spring house made of cobblestones. We spied an owl in a tree near Cataloochee Creek as we drove back to our starting point, but my camera didn’t do justice to the subject, so I will not include the photos here. Apparently this is good owl territory, as several people have mentioned seeing owls haunting this section of the creek. Mike provided us with a sampling of cold sodas when we got back to his van. He has been trying to convert me to a beverage I hadn’t even heard of before I moved to Asheville, Sun Drop and Diet Sun Drop. As it turned out, he had another chance to win me over. I absentmindedly left my boots in his van, and when he returned them to me a few days later, I found that he had tucked a Sun Drop into the left boot and a Diet Sun Drop into the right. You know, Mike, you’re right—it is a superior beverage to Mountain Dew or other caffeinated lemon-lime flavored sodas. 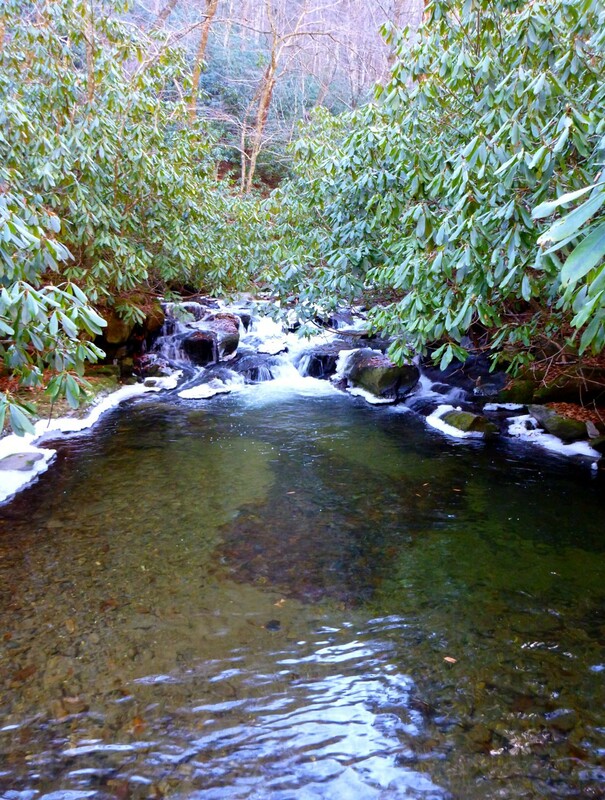 * Hattie Caldwell Davis, Reflections of Cataloochee Valley and its Vanished People in the Great Smoky Mountains. 1999. Available from Ms. Davis at P.O. Box 274, Maggie Valley NC 28751. 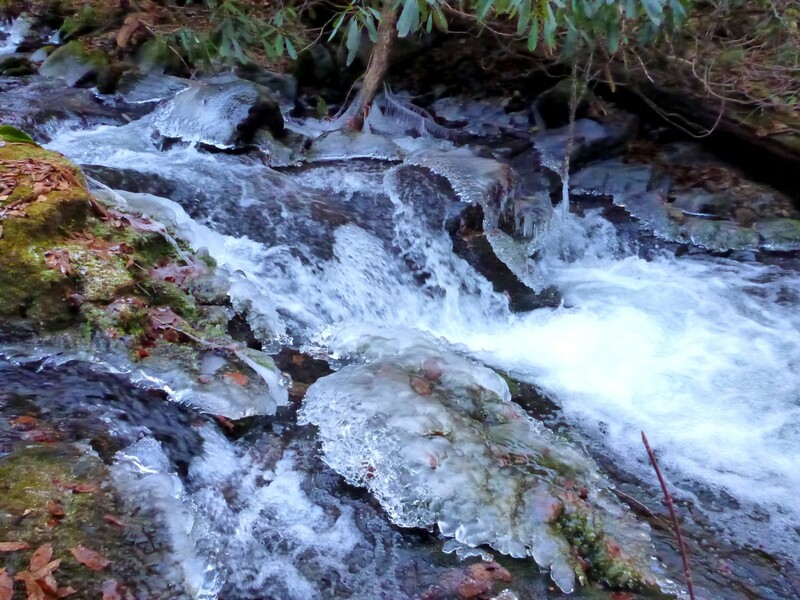 This outing in Cataloochee in the Smokies was an exploration of an old manway running along the crest of Shanty Mountain to the site of the former Spruce Mountain fire tower. 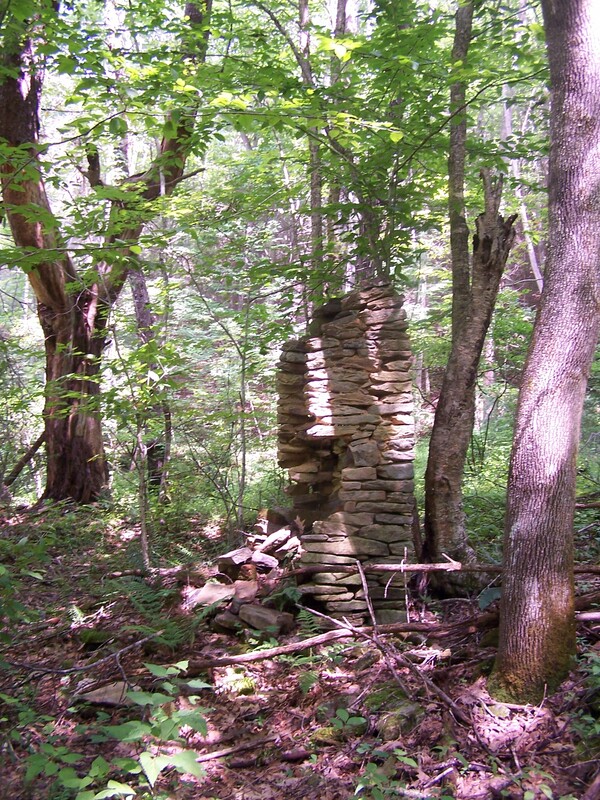 Shanty Mountain is said to have gotten its name from a shack built on the southeast side of the mountain in the early 1800s by a slave called Old Smart who herded cattle for one of the settlers. I armed myself with quite a hefty sheaf of papers: several map sections and copies of trip reports from a couple of people. A 1931 map shows a manway as it runs up Shanty Branch and joins two other old routes around Wash Ridge (and even continues over the top of the mountain and down to Falling Rock Creek), but does not show the path along the ridgecrest. The map that comes with the old Blue Book guide to the Smokies shows the ridgecrest route—although there’s hardly a need for a map on that stretch, since you just follow the ridge. 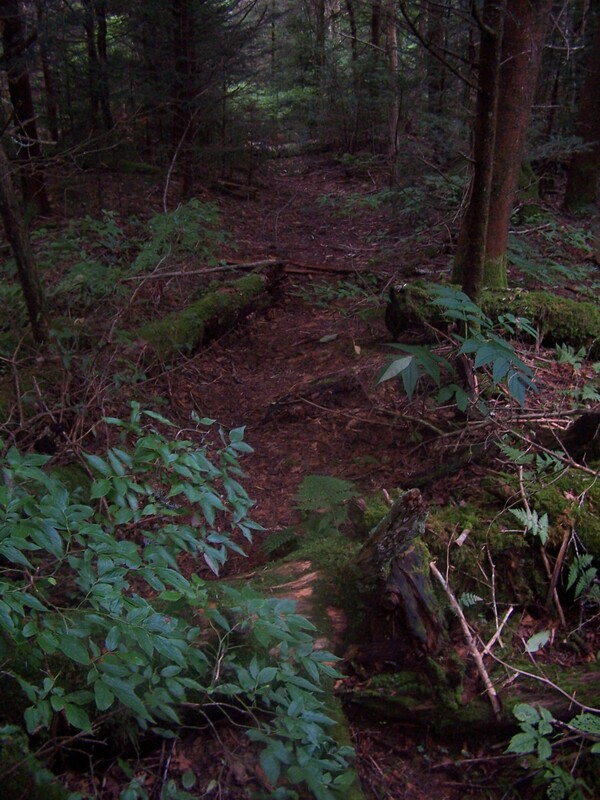 The ridgecrest route relates to the phone line for the fire tower, while the other routes relate to the Cataloochee residents and the paths they took. Kevin and Chris and I started at the Beech Grove school and tiptoed through a thriving poison ivy patch to cut across the field west of the school, hitting an old road along the tree line. It was easy to follow. 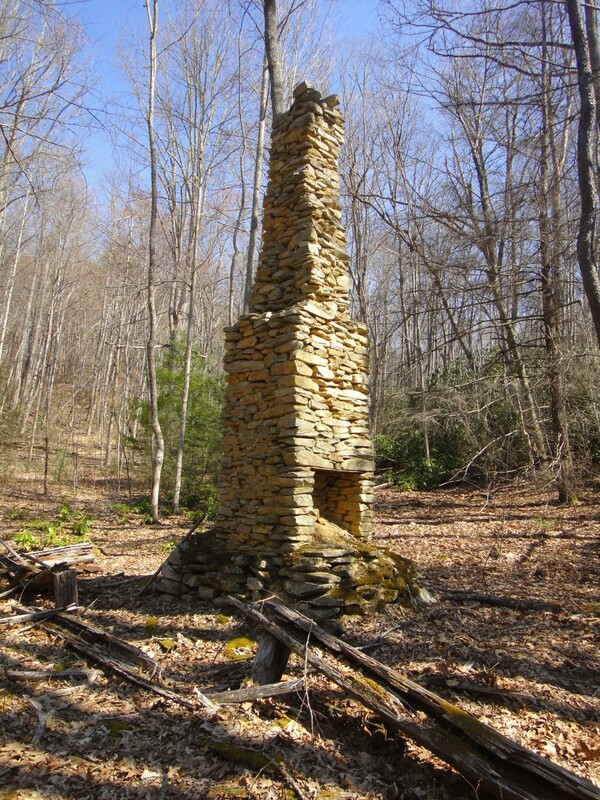 We came to a chimney at the site of the former George and Mag Caldwell home. 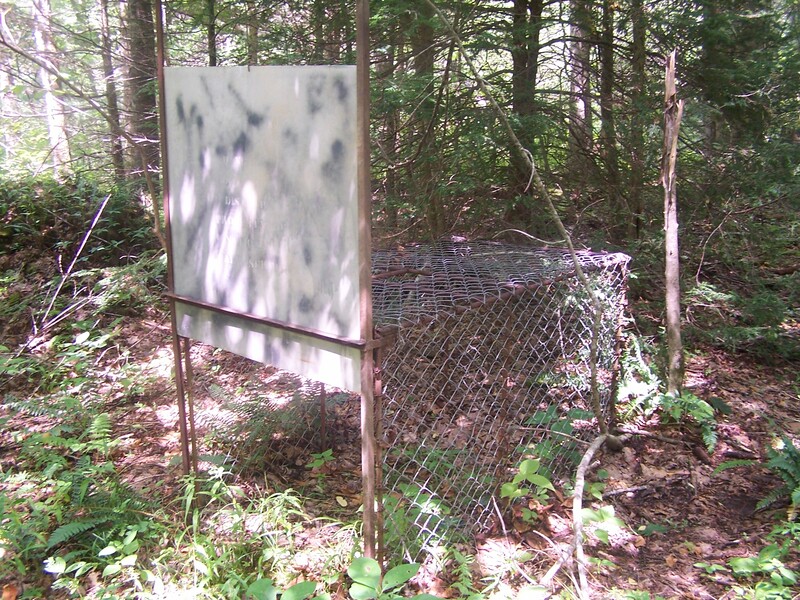 We passed an inactive hog trap. All along our route—up the mountain and along the ridgecrest—we saw much evidence of hogs. I don’t think I’ve seen so much ground rooted up anywhere else in the park. Not long thereafter, we reached a “Point of Great Uncertainty” mentioned in both of the trip reports I carried. 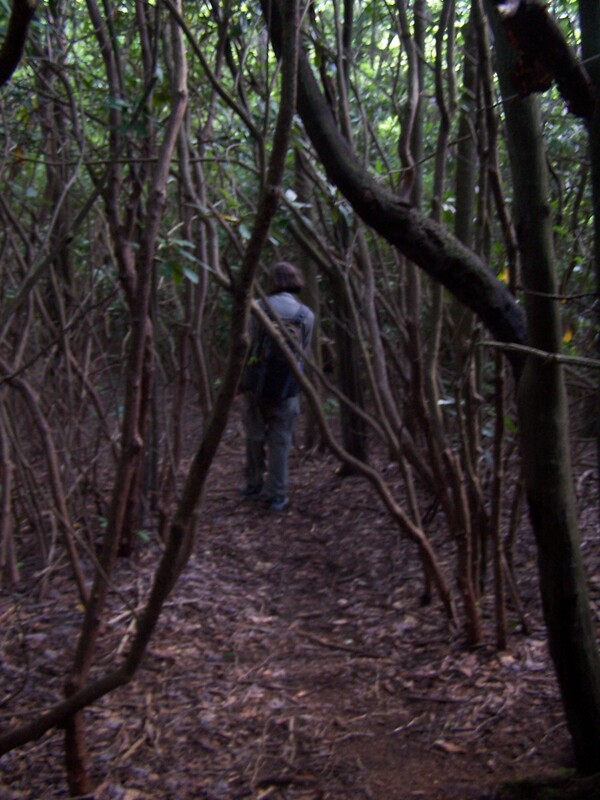 One person had crossed the branch, run into a lot of rhodo, and fought his way up a laurel-infested slope, while the other had simply gone right up the branch, finding traces of old phone wire in the midst of the creek. Both reports advised avoiding a path into a side hollow, and we did pass one path but followed another that angled up a draw to the right—probably the very route the others had said to avoid. The result: a nice easy walk up to the main ridge! We started finding telephone wire near the top. The disadvantage of our route is that we hit the ridge east of a shallow gap, so we had to drop back down a little bit. But the way along the ridge remained fairly easy at first. The telephone line appeared intermittently. It seemed that in places where it lay on the ground, it had simply become covered in decomposing leaves that resulted in a few inches of soil over the line. 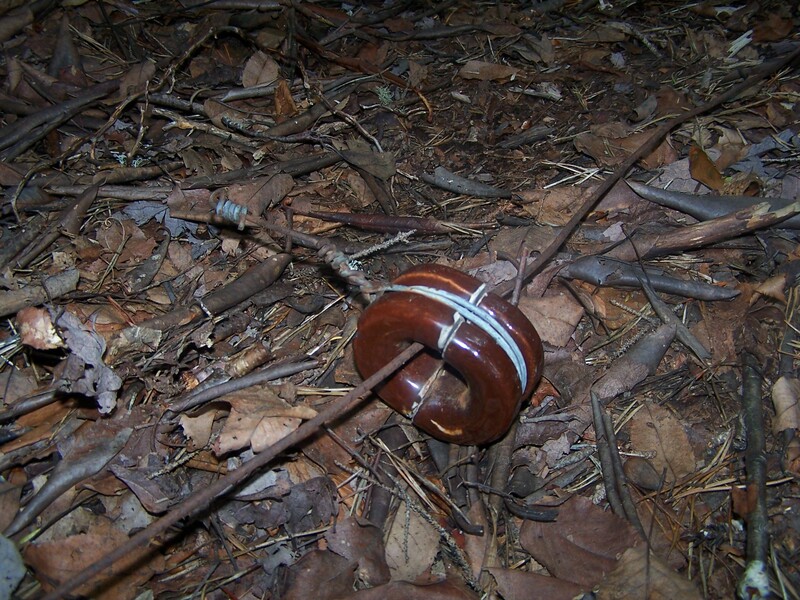 It did not seem to be broken at any point, and there were ceramic insulators on it at points. 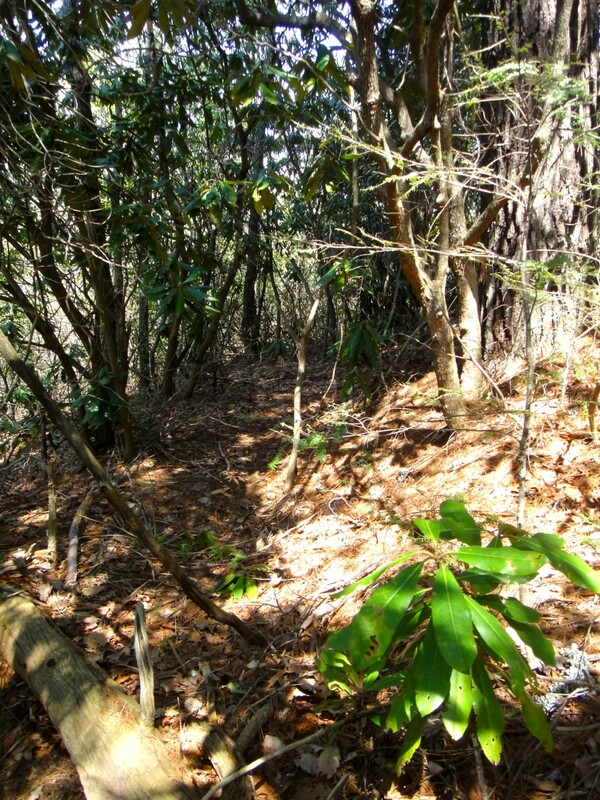 The way steadily got thicker with laurel and rhodo, though we were able to make decent progress for a while, ducking under low branches. Above 5000 feet, we crawled much of the way. It was extremely slow. Finally, we got up into the spruce-fir zone, and things opened up quite a bit. The fire tower clearing was completely grown up in blackberries. 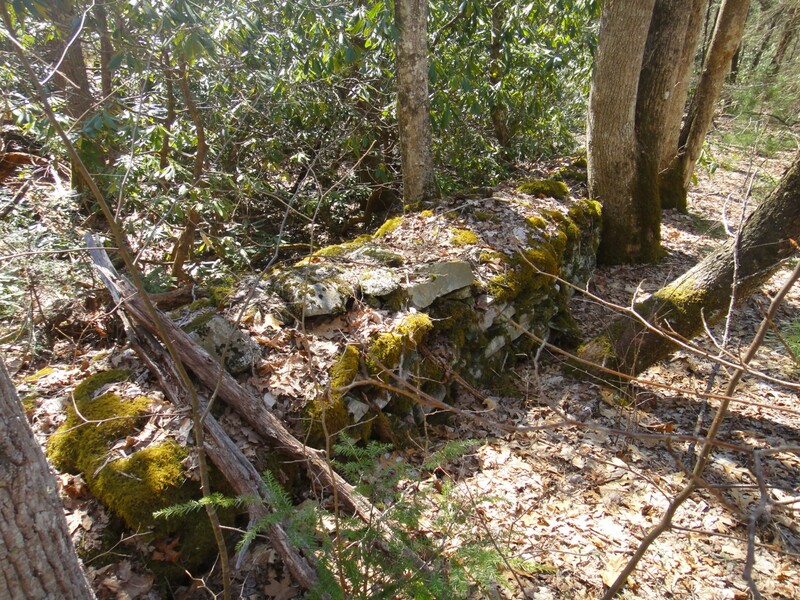 It was such a dense thicket that we did not try to find the tower’s foundation. 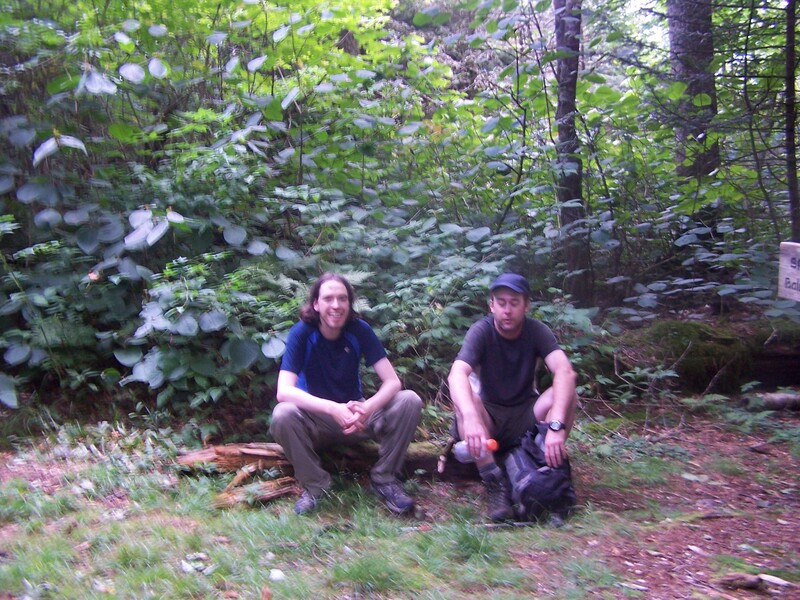 We continued following an old, overgrown trail that was riddled with blowdowns to the junction of the Spruce Mountain and Polls Gap trails, where we stopped for a rest. Because of certain schedule constraints, we had not started our hike until after 11:00 in the morning. By the time we reached this point, it was 6:30—and we had gone less than five miles. 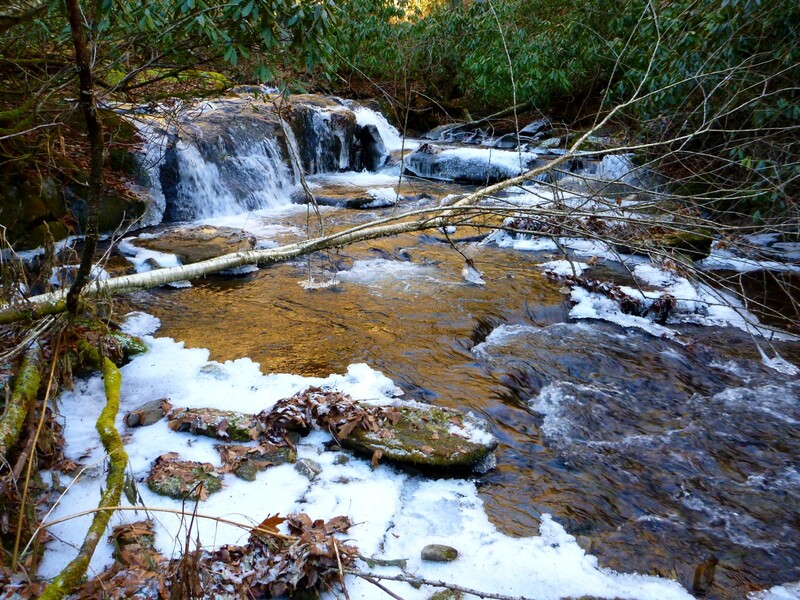 My original idea had been to drop off the north side of Shanty Mountain and go off-trail to Falling Rock Creek, then connect with the Palmer Creek trail. But now we were gun-shy about the conditions. If the north slope turned out to be anything like the upper ridgecrest, it could have been “the slog from hell”—with a real danger of getting caught off-trail in the dark. 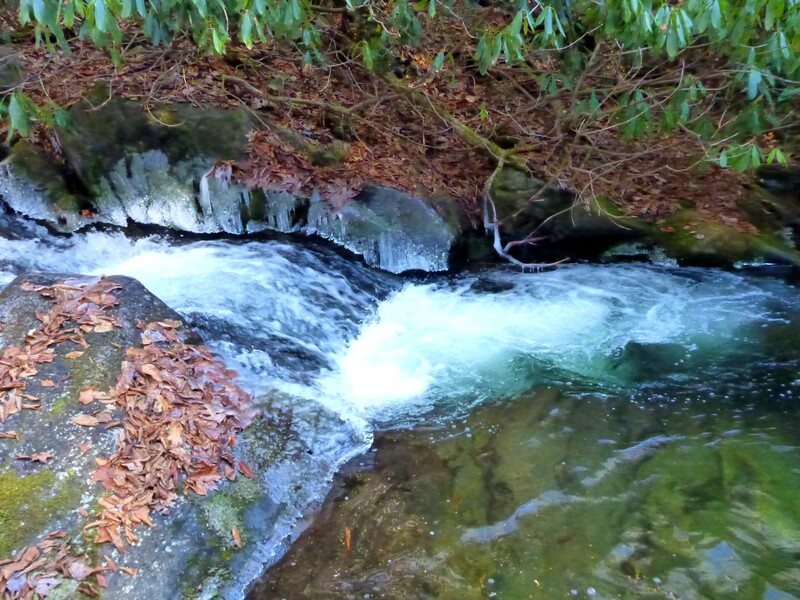 So we decided to follow the Spruce Mountain trail to the Balsam Mountain road and walk along that to the upper end of the Palmer Creek trail. One car passed us on the road, and we stuck out our thumbs. An elderly couple stopped and apologized that their car was too full (the back seat was heaped up with belongings) but offered us some cold sodas. The thought was nice, but we declined and continued along our way. The road distance might have been two or two and a half miles. We had some nice views of the north side of Shanty Mountain, looking very imposing and wild from this angle. 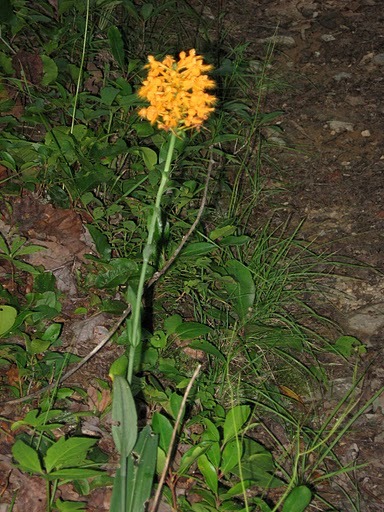 Then we started our trek down the Palmer Creek valley, passing a beautiful stand of yellow fringed orchis near the top. My picture didn’t turn out in the dim light, but Chris got a better one. Yellow Fringed Orchis. Photo by Chris Sass. Darkness fell when we still had a couple of miles to go, but we put on our headlamps and walked through a wonderful sonic tunnel of katydids calling back and forth in choruses all around us and the rushing, tumbling sounds of the stream. Something blooming filled the air with a pleasant fragrance. By chance, I have done more night hiking than usual this summer, and I feel that it has much to recommend it. We reached our cars at 9:45, just a bit concerned we might get stuck behind a gate on the Cataloochee road that had a sign saying “Closed at sunset.” It turned out to be closed, but not locked. 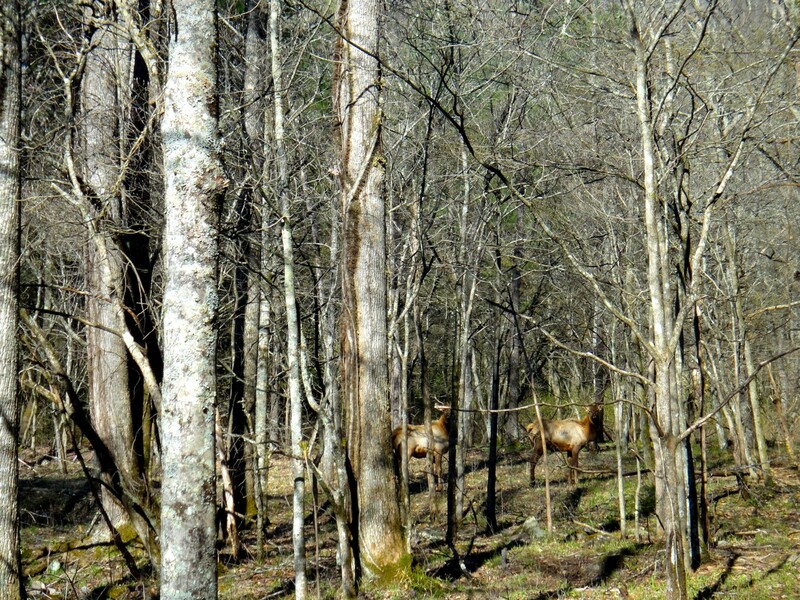 We passed an elk by the road, and continued out along the twists and turns of the Cove Creek road—I did not meet a single other car all the way to I-40 on this Sunday evening. 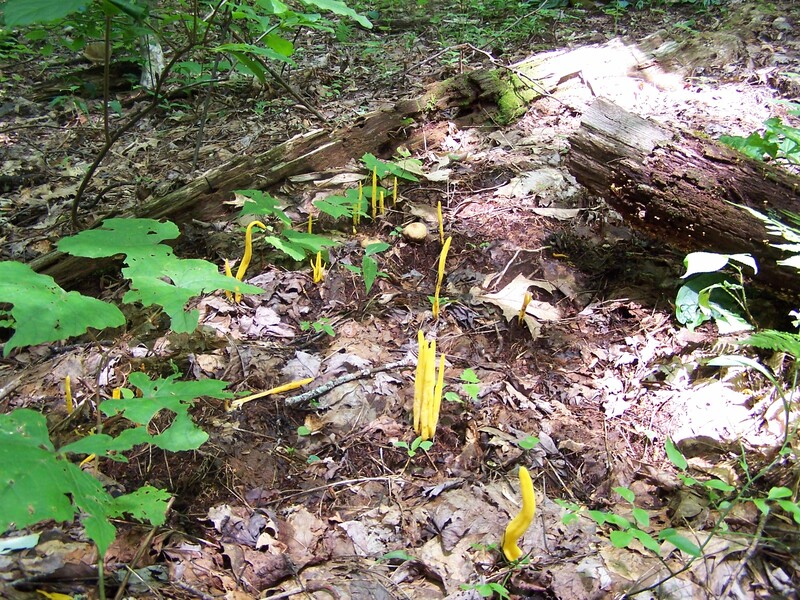 We saw countless mushrooms and fungi on this hike---of all different colors!